Wild Bird Food Sale 2018 | Faddegon's Nursery, Inc.
Oct 5, 2018 | What's New? Wild Bird Food Advance Order Sale is in effect. Get the lowest prices of the season now and stock up for the winter! Is Fall Bird Feeding Different? Many people feed birds all year-round, not just for the bird’s sake, but to enhance the chances for great birdwatching right around the home. Are summer feeding and fall feeding different in any way? It’s an old myth that once you start feeding birds, you mustn’t stop. Birds will find food. Quickly! Fall does, however, signal the time to begin feeding for those who don’t do it during the summer months. Clean all feeders whether they’ve been out during the summer or stored since last year. Add suet feeders. Suet provides a very high energy dietary addition for wild birds. 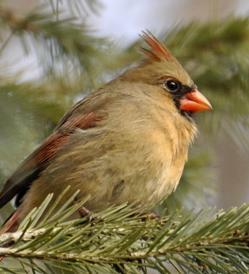 Wild birds that stay with us during the winter can really use this boost to stay warm. Adding fruit and nuts to the bird feeding menu is also very helpful in fall. As berries and other sources disappear with plants going into dormancy, birds will love some of these nutrient-rich foods. Consider keeping your birdbath going through all seasons. Winter is particularly difficult for birds when natural sources of water freeze and bathing is essential for birds. Birds Know More Than You Think They Do! Low-quality foods contain a lot of fillers and seeds that birds don’t care for. They know the difference just like us! They’ll let you know pretty quickly if the food you’re providing doesn’t meet their needs for high-energy nutrition. What’s the most commonly used bird food? Black Oil Sunflower seeds are the go-to year-round food for wild birds! If you want less mess around the feeder, switch to Sunflower Hearts. Sunflower hearts are Sunflower seeds with the ‘shell’ removed. No mess!